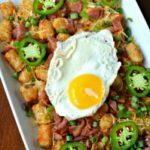 Home » Food » Easy Totchos Recipe…with Bacon! I am a sucker for easy recipes…and bacon…and football. 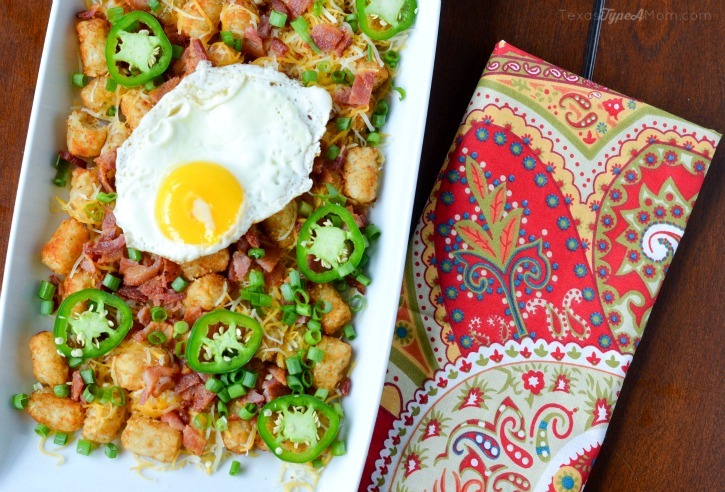 This easy totchos recipe combines all of my favorite things into one dish. I realize there’s no football, but just imagine how amazing this recipe would taste while watching the game! I don’t know about your kids, but I have a couple of picky eaters on my hands. These girls keep me on my toes with their changing tastes and limitations on what they will or won’t eat on any given day. A couple of things are staples in their diet and they’re guaranteed to eat. 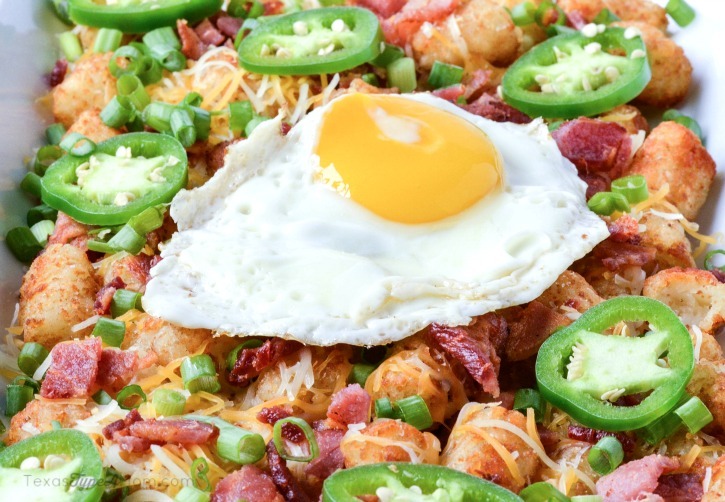 Tater tots, bacon, cheese, and eggs are a few of those. So on those occasions when the thought of another night of chicken nuggets and tater tots are too much to bare, alternative meals we can all enjoy is definitely in order. 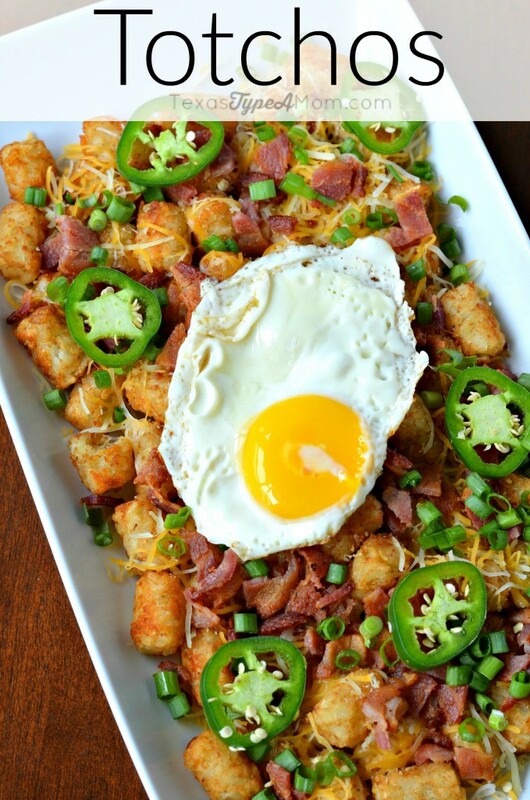 Thus, the birth of this easy totchos recipe. I need something that’s easy to make on busy weeknights (although this makes a great breakfast or even appetizer while watching football) and this fits the bill. And I can make this as spicy or mild as I like with just a few minor modifications. While the girls will definitely eat the greens onions, the jalapenos are still a little much for them. So for now, my husband and I enjoy the spicier bites and love that we can still get a little kick to our meal while still having it kid-friendly. Tater tots meet nachos in this easy recipe that can be made as an appetizer or main dish for any time of day and is especially perfect for football season! We eat this as a meal and will serve four, as an appetizer I'm sure it would serve 6-8. Cook tater tots in preheated oven according to the package. I like my tater tots even crispier than the package describes and cook for another 5- 10 minutes on top of the time recommended. When you have about 15 minutes left on the timer, fry 4 slices of bacon in a skillet over medium high heat. Once the bacon is crispy and cooked through, coarsely chop it and set aside. Drain some but not all of the bacon grease and cook your egg over easy. 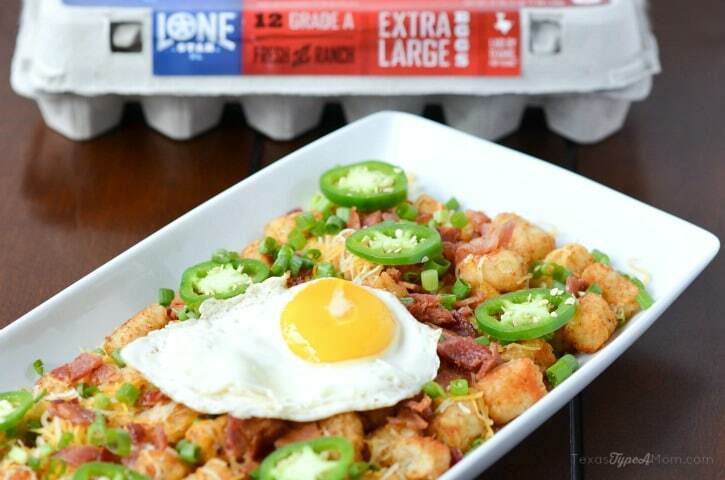 Once tater tots are done, place on dish and then top with cheese, bacon, green onions, jalapenos, and finally top with the egg. Garnish with any additional typical nacho toppings and enjoy! If you’re looking for more egg recipes for football season, make sure you check out my Spicy Deviled Eggs Football recipe!